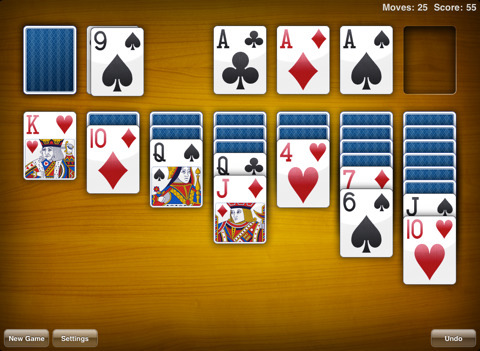 There’s nothing like a good solitaire game to distract you from work—especially one that looks this nice. Right off the bat, you’ll notice the attention to detail just looking at the cards as they have a slight texture and a glimmery shine (not that playing cards should be shiny). Real Solitaire HD (for iPad) features very smooth animations, transitions, and sounds as cards slide out of the deck onto the surface. The game play is just as you would expect: drag and drop cards using your finger, double-tap to autoplay a card to the appropriate position, as well as auto flipping cards. A well-placed Undo button, which allows unlimited undos, is also available if you accidentally moved a card(s) to an unintended spot. The settings are standard in being able to choose between one and three card draw, standard or Vegas scoring, and timing your game. You can also easily change the wallpaper of the game table to a choice between eight included high quality images and colors or select a custom one from your photo albums. It will auto save your game as you play so you can exit any time and be assured it will be right where you left off when you start it back up. Additionally, it supports all orientations of your iPad (landscape, portrait, etc). The free version of the game is ad-supported with wide ads at the bottom of the screen. They can be somewhat distracting as every ten seconds or so they do a 3D flip to switch to the next ad. At least when your cards flow to the bottom of the screen, they do go over the ad and not underneath it. Overall, it’s a nice iPad game from Edge Rift with crisp, clean graphics, easy game play and the settings you expect from a computer-based solitaire game. However, it’s not worth the $10 price tag as listed on the developer’s website. According to their listing in iTunes, they are offering it at $1.99 for a short time. AppSafari review of Real Solitaire for iPad was written by Kyle Hayes on July 15th, 2010 and categorized under App Store, Board, Free, Fun, Games, iPad apps, Puzzler. Page viewed 4933 times, 1 so far today. Need help on using these apps? Please read the Help Page.